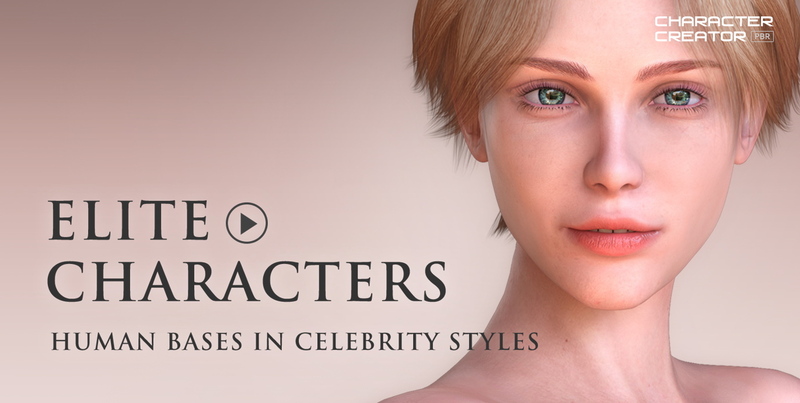 These 10 highly detailed digital human characters are designed in chosen celebrity styles. Not only they look gorgeous, you can freely blend between their morphs, mix them with other hair, outfits, accessories to best present your character for live mocap, real-time animation, or artistic render. ● RTL Eye System - this new eye system provides ultra realistic real-time eye render in a 3D scene that is purely lit up with real lights. RTL eyes work for both shader modes. By default, it’s in Traditional Shader mode, which is optimized for real light reflection. You can also switch them back to PBR shader mode for IBL reflection. Please watch this video to know more about RTL design. ● Unique Eyes and Teeth - Each character has its own unique eye material settings corresponding to his or her face shape and ethnic origin. The gum and tooth structure are individually adjusted to best fit each face shapes. ● Skin Preset and Skin Morph - Both Skin Preset and Skin & Morph Preset are provided for full body and head only. Most notably you can use the Head Skin Morph to switch avatars’ head, so that the body skin color can naturally follow the new head skin change. ● Head and Body Morph - Each character has separated head and body morph. You can change a character’s body morph without affecting his or her face shape, and vice versa. ● Additional Base_IBL and Base_RTL projects are provided for the easy light scheme change, it also lets users start with an absolute neutral body shape. ● RTL stands for Real Time Lighting, optimized for projects that are lit up with real lights without using IBL. You can find all Elite character content under their corresponding CC3_RTL folders after installation. Please find out more from the product page HERE. What hair is used for the promo pics and where do we get them to make a full character per the promo pics? Yes that is one of my questions as well, especially Travis' hair! LOL!! 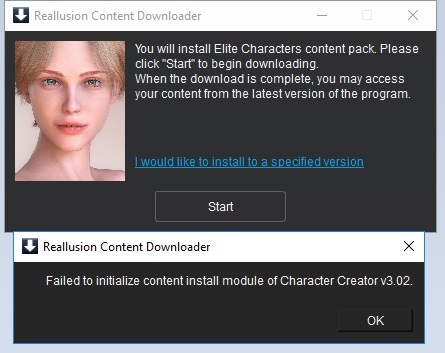 "Failed to initialize content install module of Character Creator 3.02"
Also gives error if I try to use an iClone-specific install. I confirmed I am not using a proxy server. Is there a latest version of RL downloader, I have 2.27, is that the latest? Hey Tony, I hope that this will help....I don't know a whole lot about iClone and stuff, still really a noob at this. Are you using the Reallusion Hub for your installs....if not you can get that here > Reallusion Hub maybe that will help. If that doesn't help you can take a look at this LINK to see if there is something more that might help you out. Again I hope that helps. And I think it is telling me that there is a Proxy issue, however in the Control Panel it is not selected, and in the Registry it is set as "0", for off, meaning it should not be a Proxy server error. 13:13:19 Debug: scope id: ""
13:13:19 Debug: ===>PackInfo-PackName: "Elite Characters"
13:13:19 Debug: "Has Proxy : true, ( Proxy Count : " 1 " )"
13:44:21 Debug: Repacker Lib load error : "Cannot load library C:\Program Files (x86)\Common Files\Reallusion\Downloader\Repacker2\cc3\RLVnsRepacker3.dll: The specified module could not be found." 13:44:21 Debug: InitCntDecrypter Error : 10 , RepackerDLLPath : "C:\Program Files (x86)\Common Files\Reallusion\Downloader/Repacker2/cc3\RLVnsRepacker3.dll" , RepackerVersion : "2"
Yipes -- what a PITA. I'm kind of glad I didn't see this post before I bought this pack, or it might have deterred me (but I had no problems). If this were me I'd at the very least try uninstalling the Hub and install again and see if that doesn't fix things. Then it's off to a trouble ticket. I powered down, turned back on PC. Loaded the file, and Boom....working. So, if anyone ever has this issue, try turning off your PC and trying again...I didn't change anything registry or setting-wise, but I did try reinstalling the Downloader program..maybe it needed a reboot to get itself in flow. Sometimes, if you have had the PC running for a long time, like say >1 day, it just starts having issues with things, especially if you have used a lot of applications. So, in general, if you have some fluke issue that cannot be identified and it is mind-perplexing, it may be Win10 going kaplutz on you. stuff like this is why I hate reallusions way of downloading content, whats wrong with a simple zip file with the content we pay for that we can easily add to a custom folder?